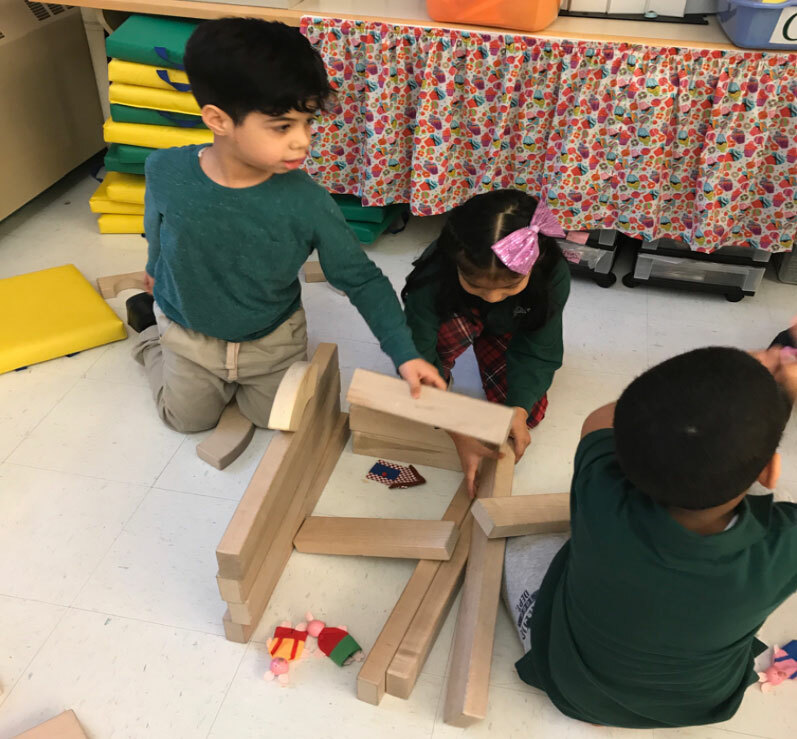 Young emergent bilingual children enter early childhood classrooms with flexible, multimodal language practices that must be validated and leveraged. 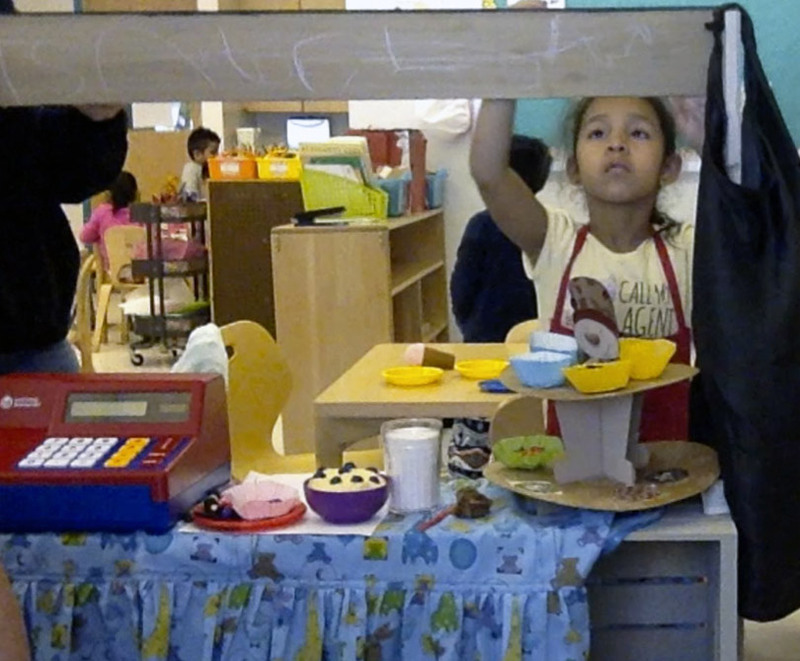 Play is an opportunity to observe, welcome, and build on students’ emergent multilingualism. Teachers of young multilingual learners must provide plenty of opportunities for young children to express their knowledge bilingually and extend their dynamic language practices within play and emergent literacy activities like reading, singing, drawing, writing, and book-related pretend play. 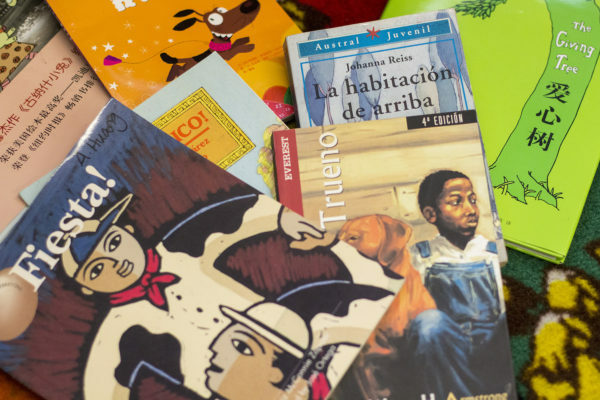 Culturally and linguistically sustaining books allow young multilingual children to connect to literature and develop their identities as bilingual readers. 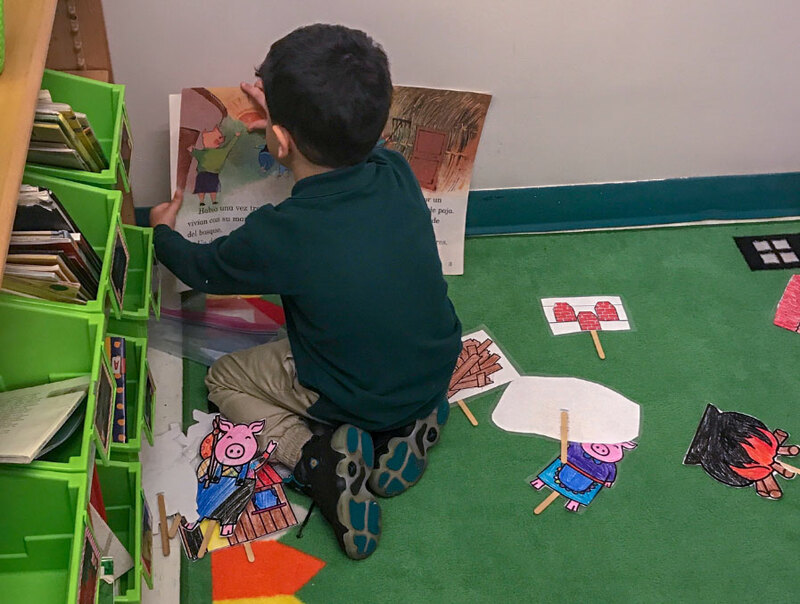 But educators can also cultivate bilingual reading identities by engaging children’s bilingual imaginations when reading traditional storybooks like Goldilocks and the Three Bears. 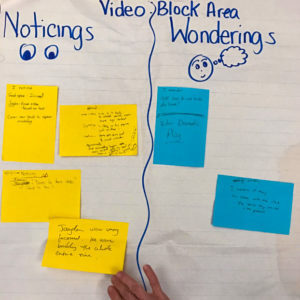 This page highlights how the early childhood teachers at one of our cohort schools observed, validated, and built upon young children’s emergent bilingualism while extending their love of storybooks to play. The Kindergarten and preschool teachers organized a Professional Learning Community (PLC) around bilingualism, play, and emergent literacy. Teachers met once a week to share ideas, challenges, anecdotes, and even videos of their students during play. Teachers also read and reflected on a variety of educational articles. 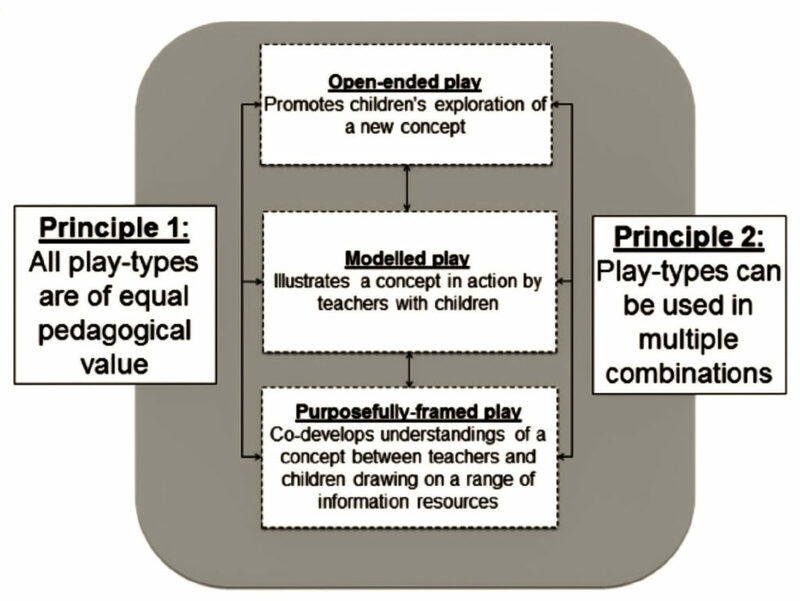 The Pedagogical Play-framework from Edwards, S. (June 2017). 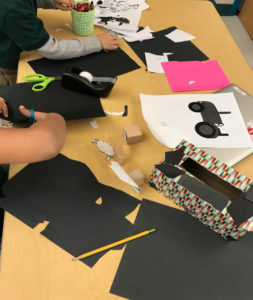 Play-based Learning and Intentional Teaching: Forever Different? Australasian Journal of Early Childhood, 42(2). 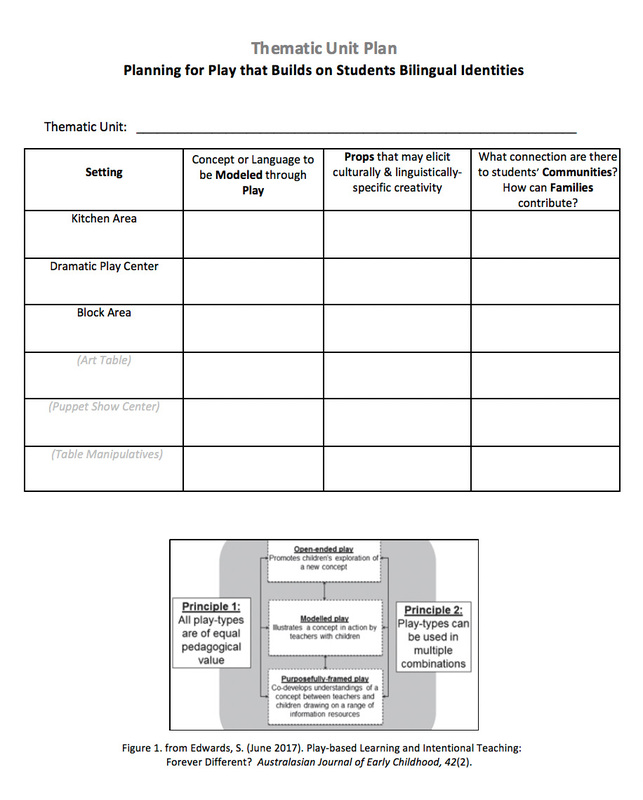 These articles also inspired the creation of this Thematic Unit Planning template, which can guide teachers in planning for play experiences that build on students’ bilingual identities. 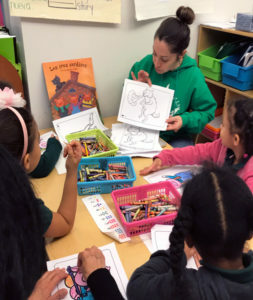 Teachers engaged children in repeated interactive read alouds of traditional storybooks, including Goldilocks and the Three Bears, The Little Red Hen, and The Three Little Pigs. 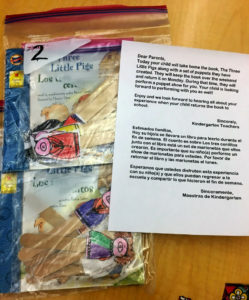 Each book was read repeatedly over the course of 2 weeks in both English and Spanish, allowing time to scaffold children’s understandings, teach concepts and vocabulary, and model reading comprehension strategies. Read books that challenge these traditional versions, such as Abuelo y los tres osos by Jerry Tello. Invite families to share versions of these stories as they’re told in other their cultures. —What if the story had taken place in their hometown? —What if the characters shared their religion/ethnicity/languages? 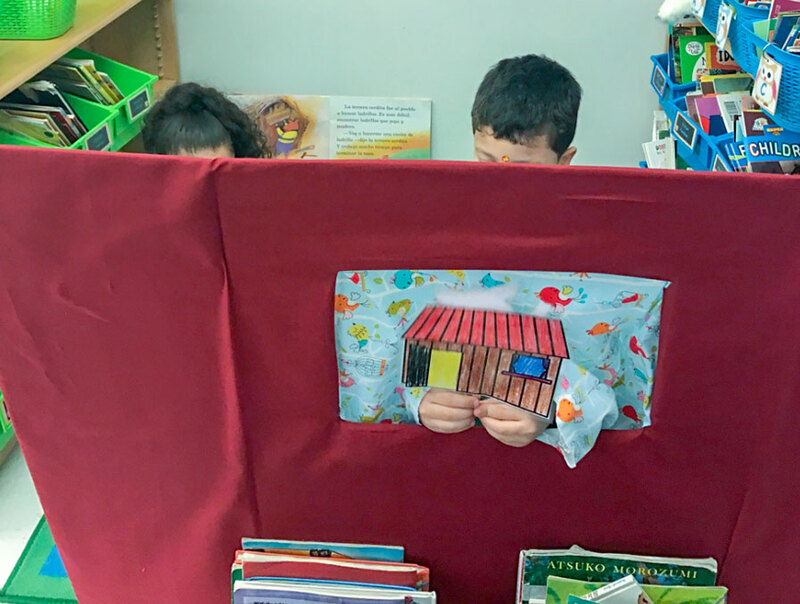 Teachers added book-related and culturally-relevant props to the Building Blocks center as a way to purposefully-frame play and promote multilingual interpretations of the books. 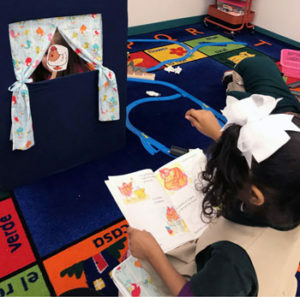 They also placed the storybooks at the play centers in both English in Spanish for students to have access to them when desired. Sometimes children would portray characters and retell the story using the language of the book. Other times, children replaced the book’s words with terms they could related to more. 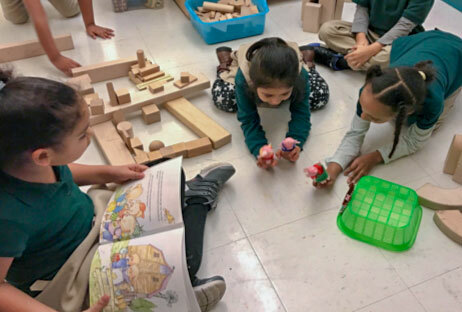 As children play, teachers should observe their language practices holistically, while simultaneously extending their bilingual linguistic repertoires. 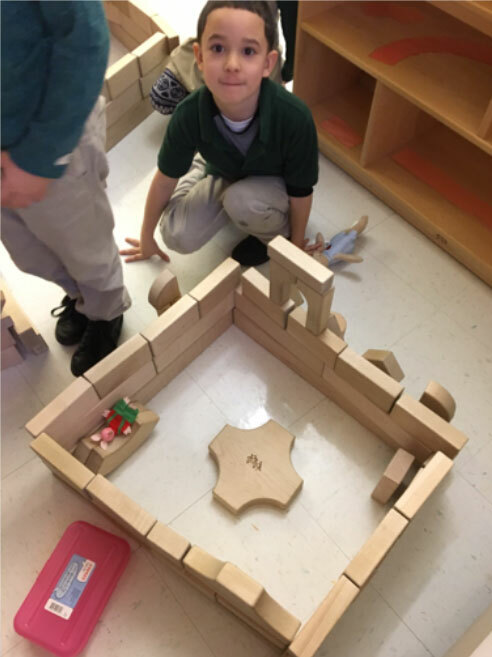 Our Child Language Observation Protocol can lead to more holistic language observations and thus more thoughtful planning for modeled and purposefully-framed play. 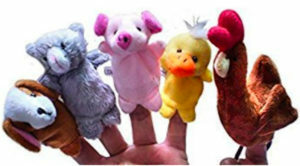 As children began to distribute the finger puppets, Ms. Betty introduced the term negociar (negotiate) while simultaneously acknowledging the language of one child who reached out to a classmate and whined, “¡por favor!” She joined the children in playing and demonstrated other words and body language one could use to negotiate bilingually. 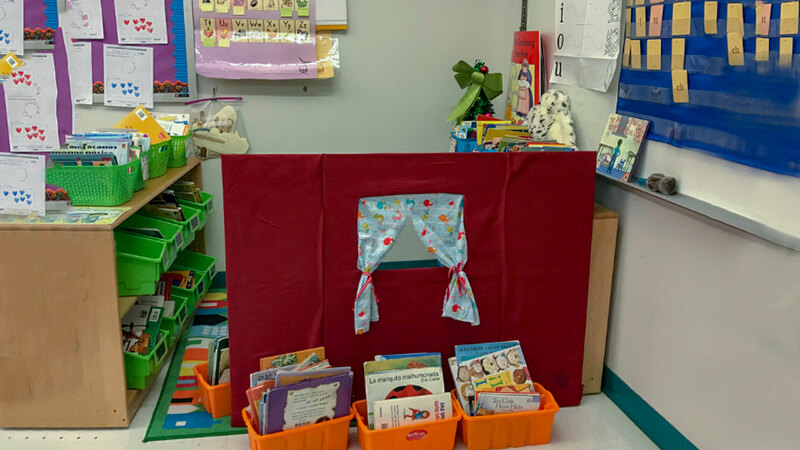 Teachers were also inspired to create a puppet show play center in their classrooms. Having the book available in both English in Spanish encouraged bilingual pretend reading, bilingual retelling, and bilingual summarizing. Students’ bilingual language repertoires were extended as they supported each other and recalled the language used in the storybooks. In one class, children decided to convert the kitchen into a bakery so they could bake bread like the hen in La gallinita roja/The Little Red Hen. In addition to bread, children were empowered to share their cultures with others. Teachers placed a variety of props that encouraged children to recreate the story with culturally-specific foods. Children pretended to bake and sell dishes like flan, empanadas, cupcakes, and bizcocho. And with bilingual customers in mind, they decided to create bilingual menus of the selections in their bakery. Emergent biliteracy skills were also supported as children named and renamed the bakery on its awning. Young children develop literacy skills as they draw and spell constructively. Teachers of multilingual children should encourage them to use all of their languages when engaging in emergent literacy activities, as well as when taking dictation of student’s ideas. Children also languaged bilingually within and beyond the story in the Art Center. The music teacher’s participation in the Professional Learning Community resulted in further interdisciplinary extensions of concepts and language. Children learned musical concepts and vocabulary by improvising melodies to represent the characters in the story. 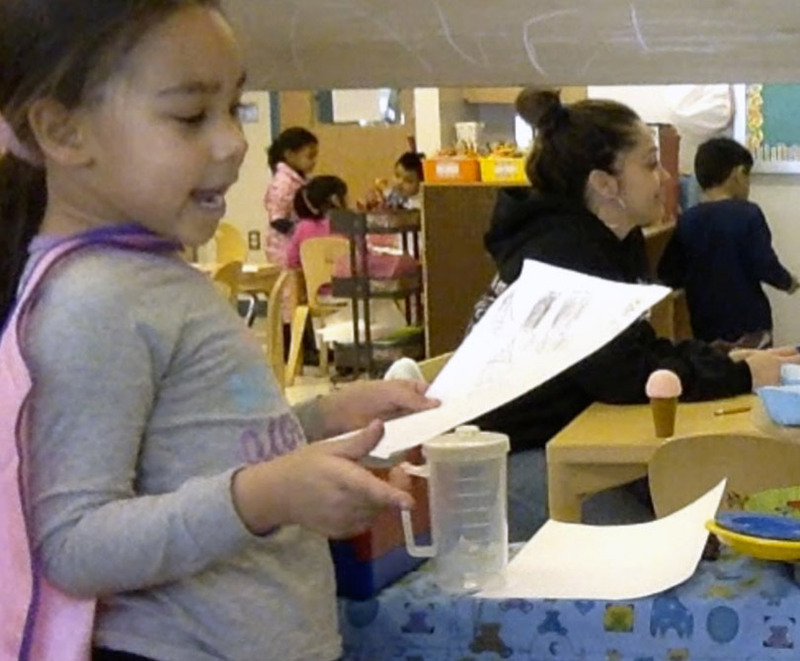 A visit to the neighborhood bakery was an authentic connection to the ideas and language that the children had brought to their play from the Little Red Hen. 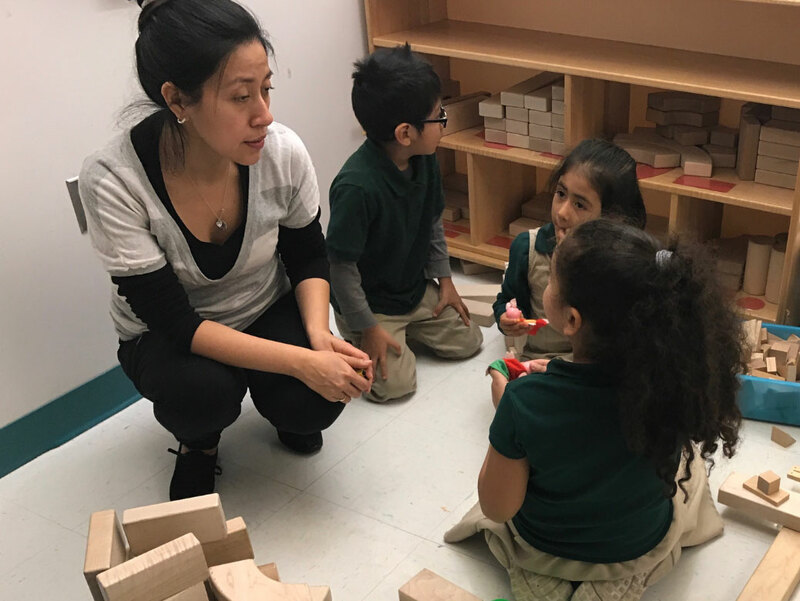 They got a chance to speak to the bilingual bakers, try some of the breads, and observe roles and language practices that connected to and further extended their dramatic play. Take-home activities encouraged bilingual storytelling at home. Bilingual books and puppets encouraged children to share the story with their family in the languages spoken at home. 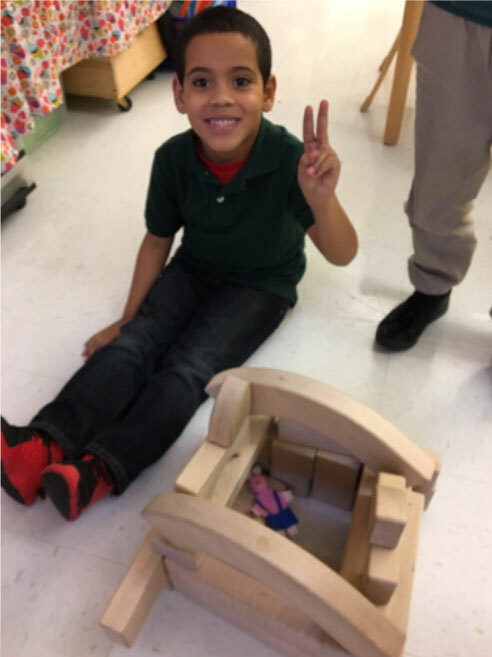 At the end of the two weeks, each class invited families and other children in the school to view their bilingual re-imaginings of each story. 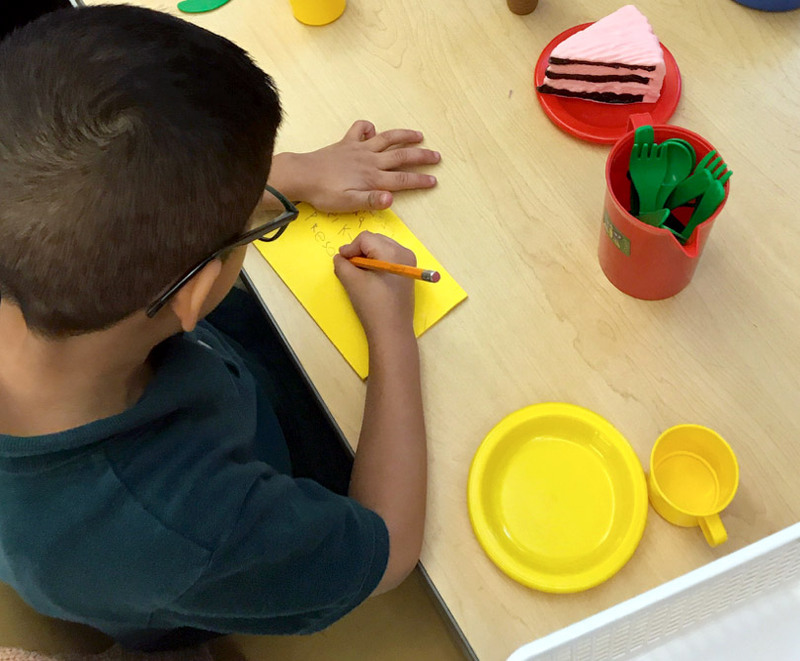 Rather than simply retell stories, teachers set the stage for students to use their bilingual imaginations to re-imagine the stories. The Pre-K children’s diverse cultural and linguistic identities transpire through their unique adaptation of Goldilocks and the Three Bears. Rather than porridge, the family ate “avena” (oatmeal). Mama bear and Papa bear speak in English, while Baby bear speaks in Spanish— reflecting the dynamic nature of students’ bilingual families.